Influential solid mechanics and materials scholar Dr. Huajian Gao was the guest speaker in the Department of Mechanical Engineering’s Distinguished Colloquium Seminar Series on Monday, November 19th, where he gave a talk titled “Topological Toughening of graphene and other 2D materials.” A professor at Brown University, Dr. Gao is the editor in chief of the influential Journal of the Mechanics and Physics of Solids and the pioneer of more than one research framework in solid mechanics and materials. 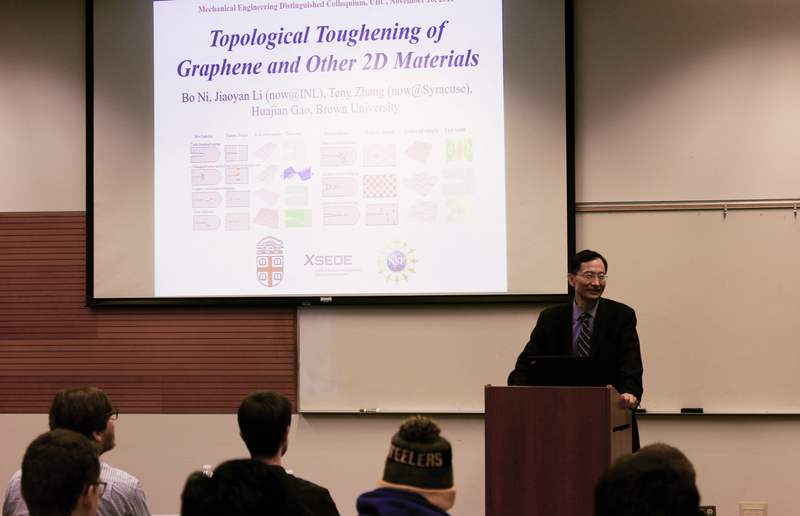 Dr. Gao was invited to speak at UBC by Mechanical Engineering faculty members Mattia Bacca and Mauricio Ponga. Huajian Gao received his B.S. degree from Xian Jiaotong University of China in 1982, and his M.S. and Ph.D. degrees in Engineering Science from Harvard University in 1984 and 1988, respectively. He served on the faculty of Stanford University between 1988 and 2002, where he was promoted to Associate Professor with tenure in 1994 and to Full Professor in 2000. He served as a Director at the Max Planck Institute for Metals Research between 2001 and 2006 before joining the Faculty of Brown University in 2006. At present, he is the Walter H. Annenberg Professor of Engineering at Brown. Professor Gao’s research is focused on the understanding of basic principles that control mechanical properties and behaviors of materials in both engineering and biological systems. He has been elected to National Academy of Sciences (NAS), National Academy of Engineering (NAE), Germany National Academy of Sciences Leopoldina and Chinese Academy of Sciences (CAS). He is the Editor-in-Chief of Journal of the Mechanics and Physics of Solids (JMPS), the flagship journal of his field. He is also the recipient of numerous academic honors, from a John Simon Guggenheim Fellowship in 1995 to recent honors including Rodney Hill Prize in Solid Mechanics from the International Union of Theoretical and Applied Mechanics in 2012, Prager Medal from Society of Engineering Science, Nadai Medal from American Society of Mechanical Engineers in 2015 and Theodor von Karman Medal from American Society of Civil Engineers in 2017. Mechanical Engineering’s Distinguished Colloquium Seminar Series brings outside scholars present their work at UBC, providing students and faculty the opportunity to learn from world-class visiting academics, and opening the possibility for potential collaborations. The Department’s next Distinguished Colloquium Seminar will be in the spring, and feature Professor Albert Shih from the University of Michigan. Dr. Shih’s research involves topics in design and manufacturing, biomedical device design, biomedical manufacturing, medical innovation, surgical thermal management, machining of advanced engineering materials, micro manufacturing, precision engineering, and optical metrology. To find out about future Distinguished Colloquium Seminars, join our seminar series mailing list.